A lot of effort has gone into making insurance policies more easily understood but plenty of us still get caught out. Just ask office worker Marie Koh. Madam Koh (not her real name) lodged a complaint against her insurer for allegedly not honouring the terms in her savings-type plan when it matured in October last year. She wanted to know why there was a big difference between the maturity payout she received and the projected maturity values. The illustrated terminal bonus was also not paid at maturity. Madam Low, who is in her late 50s, also refused to accept the insurer's explanation that the premiums paid for her policy's riders, such as critical illness, would not contribute to the accumulation of the bonus as they have no cash value. Unhappy with her lower-than-expected maturity payouts, she proposed to be paid a 1.1 per cent compounded return on the premiums paid for her savings policy. The insurer refused, reiterating that the projected maturity values were not guaranteed, something that was stated in her contract. There are many policyholders like Madam Low who find it difficult to understand their policies. Nor do they know what figures in a sales or benefit illustration document to focus on before deciding to buy. Many end up relying on financial consultants to highlight the benefits when we should make it our responsibility to understand them. If we do so, we will reduce misunderstandings and the incidence of customers being taken for a ride by unscrupulous financial advisers or being led into buying unsuitable products due to misrepresentation. When we prepare to buy life insurance, we get documents to help us make an informed choice. They include a benefit illustration, a life insurance guide and a product summary. It is tempting to gloss over a benefit illustration because it looks like a jumble of numbers. But it is worth your while to make the effort to understand it because it shows the financial benefits you may receive if you buy the insurance policy, surrender or make a claim, and if you hold it to maturity. Besides indicating benefits - both guaranteed and non-guaranteed - the benefit illustration shows the costs and charges relating to the product you are buying. Rather than getting a nasty shock later, it is prudent to analyse the benefit illustration first and know precisely what you are getting yourself into. Insurance is a long-term commitment and the consequences are dire if you need to surrender the policy early. In some cases, you stand to lose all the premiums you have paid. Let's take a look at a benefit illustration from a life insurance firm's endowment plan that has been generated for a 35-year-old male non-smoker. The annual premiums are about $40,000 for five years, amounting to $200,378, and the tenure is 10 years. Like most traditional whole-life and endowment plans, this is a participating policy where premiums are pooled with those of other participating policies in a designated "participating or life fund". The insurer invests the fund in a range of assets such as equities, government and corporate bonds, property and cash to earn returns that can used to pay benefits to you and other policyholders of the fund as well as to finance expenses. In line with the insurer's investment strategy, the proportion invested in each asset class may vary over time. You can find the asset allocation of the fund in the product summary. Besides guaranteed benefits, the non-guaranteed benefits are typically in the form of bonuses that are added to the sum assured. They cannot be later reduced or removed once declared. To help illustrate the benefits and costs relating to the policy, the insurer assumes two investment rates of return. These are purely for illustrative purposes, which means the benefits the policyholder actually receives may differ from what is projected in the benefit illustration. Since May 1994, the insurance industry has followed standards on what should and should not be included in a benefit illustration. They typically illustrate two rates of return - one up to a maximum of 4.75 per cent per year and a lower rate that is at least 1.5 percentage points below the maximum, or 3.25 per cent. These two rates have remained unchanged since July 2013. In fact, it was a much higher 7 per cent in 1994 before it was revised to 6 per cent in 1997 and cut to 5.25 per cent in 2002. The Life Insurance Association (LIA) says the two projected returns do not represent the upper and lower limits of the investment performance of the insurers' funds. The assumed higher rate of 4.75 per cent - or the maximum best estimate long-term investment rate of return - is deemed by LIA as achievable by insurers' life funds over a horizon of at least 10 years. "It provides consumers a sense of the variability of their payouts based on long-term returns achieved by the participating fund. It is important to note the long-term nature of returns, which is over a period of at least 10 years, rather than a few years," said LIA. To ensure the assumed investment returns continue to be appropriate, LIA conducts a yearly review, considering factors like investment returns for each asset class and long-term investment outlook. The illustrated investment returns for investment-linked insurance products are 4 and 8 per cent. Guaranteed death benefit: The guaranteed amount the insurer pays if the insured person dies. Non-guaranteed death benefit: The projected non-guaranteed additional amount to be paid if the insured person dies. It is calculated assuming the life fund earns yearly investment returns of 3.25 and 4.75 per cent. Guaranteed surrender value: The guaranteed amount the insurer pays if the policy is cancelled prematurely. As there are high costs involved in early surrender, policyholders suffer a loss if this happens in the first few years. Non-guaranteed surrender value: The projected non-guaranteed additional amount to be paid by the insurer if the policy is cancelled prematurely. It is calculated assuming the insurance fund achieves annual investment returns of 4.75 and 3.25 per cent. The projected amounts are dependent on the bonuses declared. 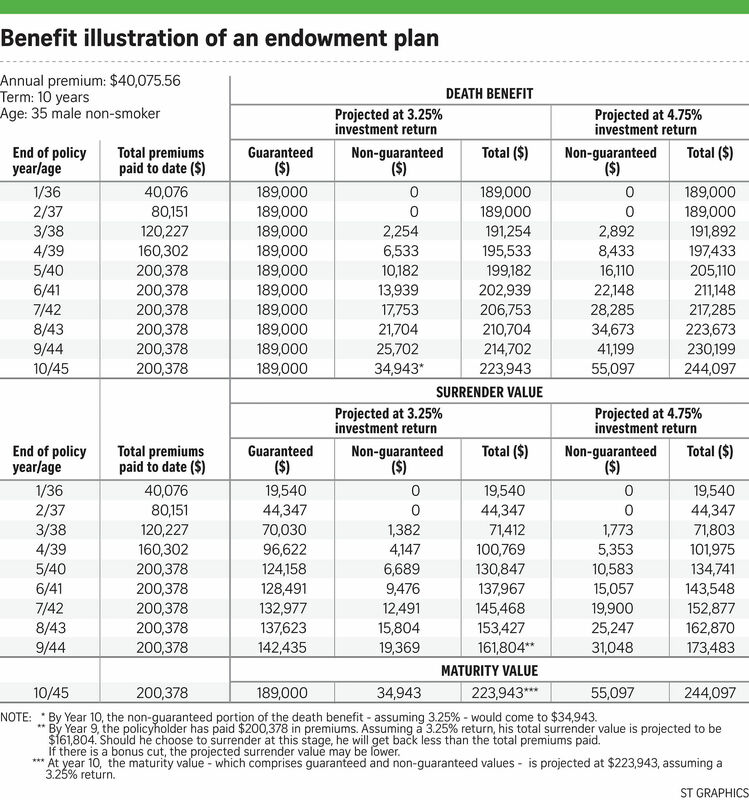 Based on the example of the 35-year-old's endowment plan, the total maturity amount - comprising guaranteed and non-guaranteed values - is projected as $244,097 at the end of 10 years, assuming a 4.75 per cent return. However, if the assumed return is 3.25 per cent, the projected total maturity amount would be $223,943. Total distribution cost: The total cumulative cost that the insurer pays to the distribution channel for the policy sale. It includes cash payments such as commissions, cost of benefits and services. Effect of deduction: The deductions are taken out from the policy. They include the cost of insurance, distribution, expenses and surrender charges. Finance experts say that since the projected returns do not represent the real returns received by the client, one way to assess the product is to look at the guaranteed values because that is the amount that the insurer is obligated to pay. 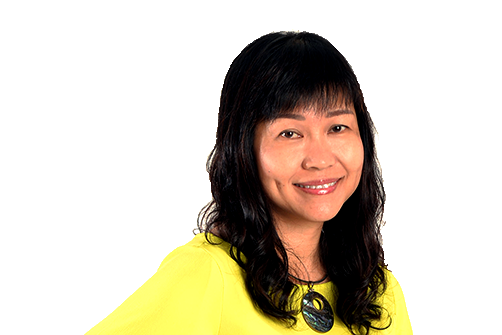 Mr Patrick Lim, associate director at financial advisory PromiseLand Independent, says when it comes to endowment plans, he would not recommend those offering a guaranteed maturity cash benefit lower than the total premiums paid. Said Mr Lim: "The guaranteed cash value must be higher than total premiums paid on maturity of the plan. For example, if total premiums equal $10,000, the guaranteed cash value must be higher than $10,000, and the higher the better because insurers have to honour the guaranteed cash value on maturity." In the example above, the guaranteed maturity sum is $189,000, less than the $200,000 in total premiums. You can also ask financial consultants to work out the effective or net returns of the benefits based on the projected investment returns. This is because the policyholders' net return is usually substantially lower after taking into account management expenses, distribution and other costs such as mortality. In the example above, the net return at the projected maturity value of $223,943 - if the insurer makes an investment return of 3.25 per cent a year - is only 1.4 per cent a year. At the projected $244,097 at maturity - based on an assumed return of 4.75 per cent a year - the net return is 2.49 per cent a year. LIA has confirmed that in the near future, the benefit illustration for par policies will be further enhanced by including two illustrated effective yields to maturity based on the two projected investment returns. It is worth your while to do a comparison of similar insurance products and analyse if they can offer higher guaranteed amounts and/or net yields, among other criteria, such as their suitability in meeting your financial objectives. Websites like CompareFirst.sg can help with insurance comparison. After all, insurers differ in their investment and asset-allocation strategy. It is possible that there are similar plans that offer higher guaranteed values and net effective yields. You can also compare the insurance plan with other investment products, bearing in mind that every product carries different risks. An example is the principal-guaranteed Singapore Savings Bonds which offer decent yields, flexible withdrawals and are risk-free. And if you are uncomfortable with the product's guaranteed amounts and/or the net yields, you are better off walking away. But what if the insurers are just being cautious when they offer lower guaranteed values? Well, check out the insurer's bonus track record. It is prudent to understand how bonuses in life funds work. There are usually two types. One is a reversionary bonus, which is declared annually and becomes part of the guaranteed value. The terminal or maturity bonus is typically a one-off declared on maturity of the plan and is expressed as a percentage of the accumulated annual bonuses to date. Bonus rates have steadily declined over the years. They are affected mainly by the fund's investment strategy and experience as well as other factors such as claims and incurred expenses. Insurers may cut bonus rates and this usually happens for the cohort of policies whose previously quoted rates of return at inception have become unsustainable due to increasingly depressed yields. However, insurers do try to avoid cutting rates as this causes dissatisfaction among policyholders. Instead, newer policies are quoted with lower rates of return. With the exception of Tokio Marine, almost all insurers have cut bonuses in the past. The worst on record is AIA, which cut terminal or maturity bonuses to zero in 2001, affecting regular-premium endowment policies maturing that year, recalls Mr Lim. The bonus cuts are mitigated by the insurers' practice of "smoothening" returns in par policies. This means that in a good year, the insurer may choose to pay out its normal bonus rate and retain more surpluses. In a poor year, it may distribute more of the retained surplus as bonuses to maintain the bonus rate. The effect is a fairly smooth rate of return, which masks any volatility that the life fund may experience. Every year, you will receive an annual bonus update that will show you the bonus that your policy has accrued. You will also receive a par fund update which gives a snapshot of the insurer's life fund performance over the past three years. Do note that for some participating plans, some insurers have done away with the traditional bonus structure and are offering a non-guaranteed dividend-paying plan instead. Cash dividends are non-guaranteed, but when given do not add to the sum assured. And depending on the product design, they may be given annually only after the insured reaches a certain age or upon a claim or surrender. Furthermore, look at the long-term track record of insurers' investment returns on life funds. 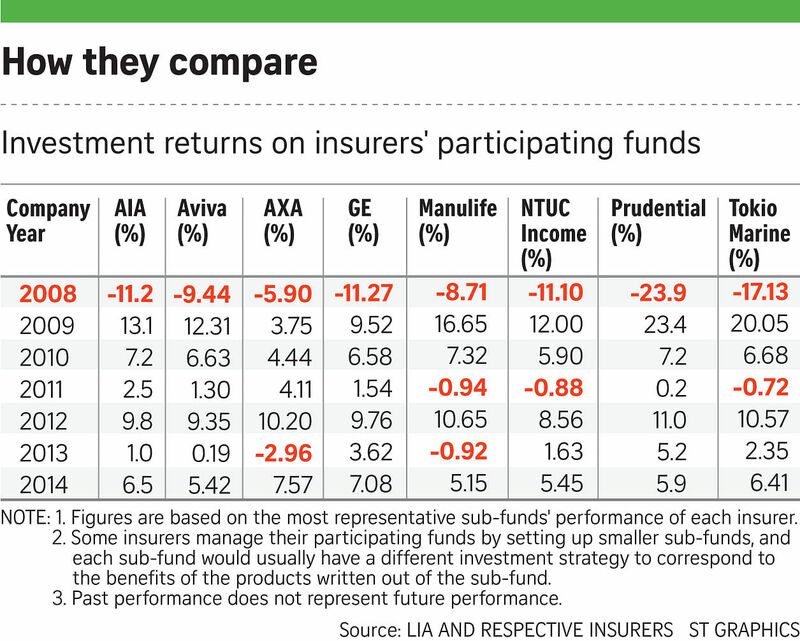 According to LIA's compilation of life funds' returns requested by The Sunday Times, insurers Manulife, Prudential, AIA and Tokio Marine have achieved average returns of above 4 per cent per annum over a seven-year period ending 2014. Last but not least, it is important to ensure that you can afford the premiums and are able to pay them throughout the plan tenure. Policyholders who surrender their plans prematurely are likely to incur losses and, in some cases, get nothing back. Recognising this, insurers have been offering "limited pay" plans that require customers to pay, say, a shorter five-year period, but the plan tenure could be a longer 10-year period.